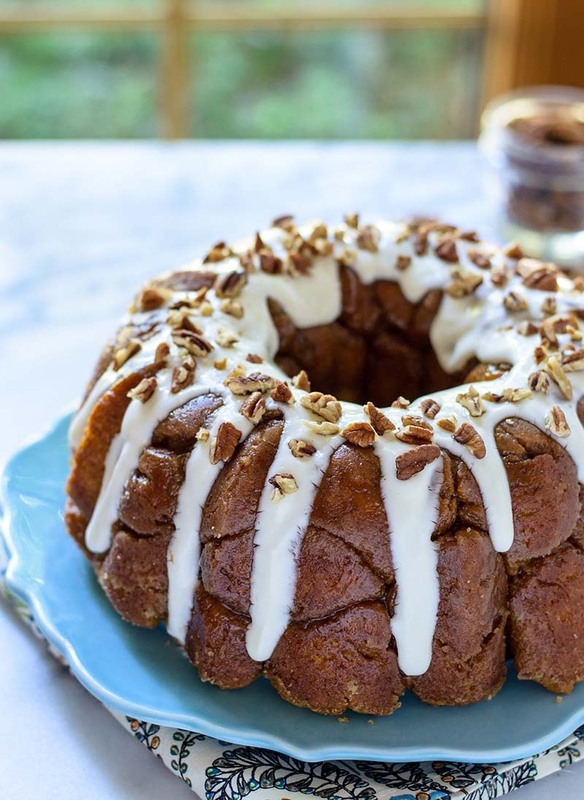 A homemade recipe for Pumpkin Monkey Bread with cream cheese glaze and toasted pecans. This bread tastes just like pumpkin cinnamon rolls, but every bite is rolled in cinnamon, sugar, and pumpkin spices and prime for picking apart with your fingers! Make the Dough: Cut the butter into large pieces. Place the milk and butter in a microwave safe bowl or large mixing cup, or in a small saucepan. Warm in the microwave (start with 30 seconds, then increase by 10-second intervals) or on the stove until the liquid reaches the 120 to 130°F. The butter may not melt completely. Set aside. In the bowl of a standing mixer fitted with the paddle attachment, beat the pumpkin puree, brown sugar, granulated sugar, cinnamon, salt, nutmeg, ginger, and cloves together on medium speed. Pour in the warmed milk/butter mixture and mix until combined. In a small bowl, lightly beat together the egg and egg yolk, then add to the flour mixture. Add the yeast, then mix until just combined. Reduce the mixer speed to low, then add 2½ cups white whole wheat flour. Mix for 5 minutes, pausing to scrape down the sides of the bowl as needed. Add 2½ cups all-purpose flour and mix until fully incorporated. The dough will be very soft and tacky. Lightly coat a large, clean bowl with cooking spray, then place dough in the bowl, turning once to coat all sides with the oil. Cover tightly with plastic wrap and let the dough rise in a warm, draft free place until doubled in size, 60 to 90 minutes. (Make ahead note: In place of allowing the dough to rise at room temperature, you may also place it in the refrigerator to rise overnight. In the morning, remove from the refrigerator and proceed with the recipe as directed). Make the Cinnamon Sugar Coating: Place the granulated sugar, cinnamon, nutmeg, and cloves in a large plastic bag. Seal tightly and shake gently to combine. Coat a 10 to 12-cup Bundt pan with cooking spray. Gently press the dough down with your fist to allow the air to release. Pinch off small pieces of dough and roll them into individual balls that are about 1¼-inches wide (you will have 45 to 55 balls total). Working 8 dough balls at a time, place the balls in the bag of sugar and spices, grip the top of the bag to seal, then shake and gently roll the balls to coat. Arrange the dough balls at the bottom of the prepared pan. Repeat with remaining dough, staggering the seams where dough balls meet as you build the layers, until all are coated and placed in the pan. Cover with plastic wrap and let rise at room temperature until nearly doubled, 45 minutes to 1 hour. Place a rack in center of the oven and preheat the oven to 350°F. To finish the coating, melt the 6 tablespoons butter and brown sugar together in a small saucepan over medium heat. Stir in the vanilla extract. Uncover the bundt pan and pour the melted butter and brown sugar over the dough. Bake the monkey bread for 30 to 35 minutes, until golden brown on top and the internal temperature of the dough reads 185 to 190°F. Check at the 15-minute mark and loosely cover the pan with aluminum foil if the bread is browning too quickly. Let the monkey bread cool in the pan for 5 minutes, then invert onto a serving plate. Prepare the Glaze and Serve: In a medium bowl, beat together the cream cheese and powdered sugar until smooth. Add the milk and vanilla. Pour the glaze over the monkey bread, allowing it to run over the top and down the sides, then garnish with toasted chopped pecans. Serve immediately in slices, or pick away with your fingers!